Subject: Antique drawing, untitled. A landscape with a farm house and a church tower in the background. Condition: Very good, given age. Ample margins. Right edge a little browned. General age-related toning and/or occasional minor defects from handling. Please study scan carefully. Size (in cm): The overall size is ca. 24 x 17.5 cm. The image size is ca. 24 x 17.5 cm. Size (in inch): The overall size is ca. 9.4 x 6.9 inch. The image size is ca. 9.4 x 6.9 inch. 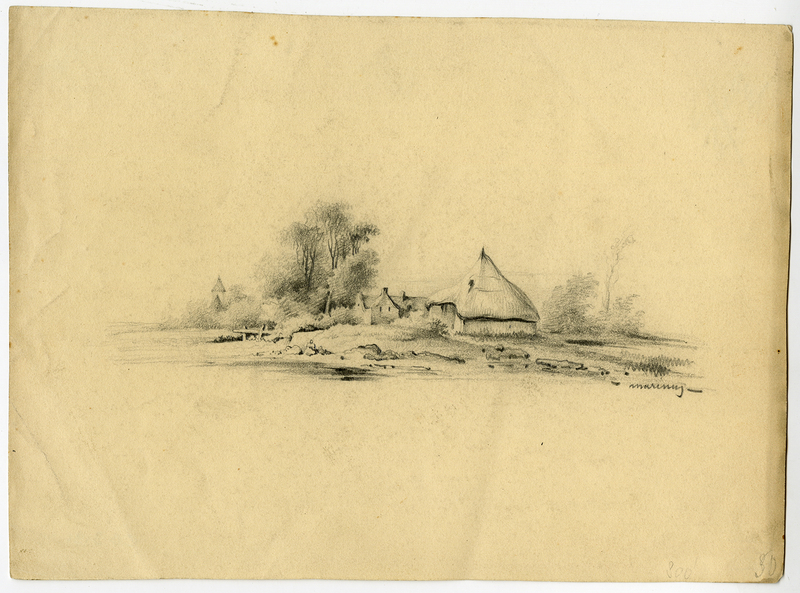 Description: Signed in pencil in the lower right of the drawing. Artists and Engravers: Made by 'Marinus' after own design. Nothing concerning Marinus could be found. Probably French.